Editorial responsibility for content identification, analysis, editing, and management process to improve quality and quantity of clips on website. 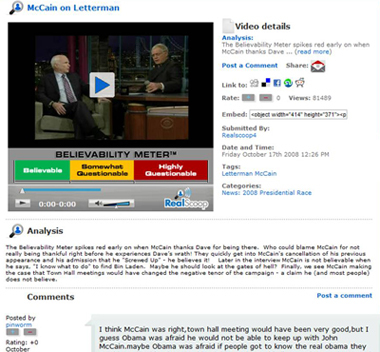 Image below shows video of John McCain's apology to David Letterman during Presidential campaign. Click here to see the Believability Meter in action as Marion Jones denies steroid use (40 sec).